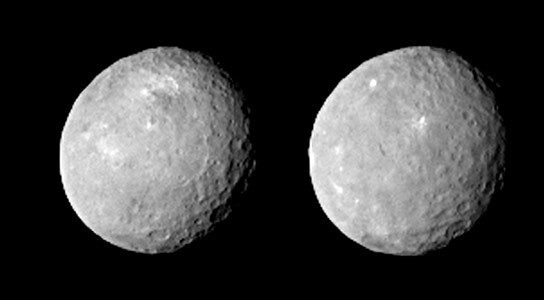 These two views of Ceres were acquired by NASA’s Dawn spacecraft on February 12, 2015, from a distance of about 52,000 miles (83,000 kilometers) as the dwarf planet rotated. The images have been magnified from their original size. This new image from NASA’s Dawn spacecraft reveals more details of the dwarf planet Ceres. Craters and mysterious bright spots are beginning to pop out in the latest images of Ceres from NASA’s Dawn spacecraft. These images, taken February 12 at a distance of 52,000 miles (83,000 kilometers) from the dwarf planet, pose intriguing questions for the science team to explore as the spacecraft nears its destination. Dawn’s mission to Vesta and Ceres is managed by the Jet Propulsion Laboratory for NASA’s Science Mission Directorate in Washington. Dawn is a project of the directorate’s Discovery Program, managed by NASA’s Marshall Space Flight Center in Huntsville, Alabama. UCLA is responsible for overall Dawn mission science. Orbital ATK, Inc., of Dulles, Virginia, designed and built the spacecraft. JPL is managed for NASA by the California Institute of Technology in Pasadena. The framing cameras were provided by the Max Planck Institute for Solar System Research, Gottingen, Germany, with significant contributions by the German Aerospace Center (DLR) Institute of Planetary Research, Berlin, and in coordination with the Institute of Computer and Communication Network Engineering, Braunschweig. The visible and infrared mapping spectrometer was provided by the Italian Space Agency and the Italian National Institute for Astrophysics, built by Selex ES, and is managed and operated by the Italian Institute for Space Astrophysics and Planetology, Rome. The gamma ray and neutron detector was built by Los Alamos National Laboratory, New Mexico, and is operated by the Planetary Science Institute, Tucson, Arizona. 5 Comments on "NASA’s Dawn Captures Sharper Images of Ceres"
It looks like a snow filled crater to me… or perhaps some solid Co2? Another waste of money by Fartbama and big government!! Why are these in black and white? The HST images showed Ceres to have a reddish-brown tint. It’s 2015 and even Voyager gave us color pictures back in the 1980’s. Amazing the things we can acomplish and what we shall if we can just not wipe ourselves out.